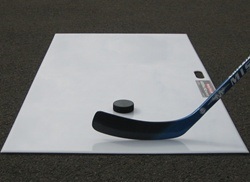 Hockey shooting boards (also known as shooting pads) are geared towards hockey players who want a smooth, flat surface to shoot off of. The idea behind these boards is to give you a surface that is as close to ice as possible. Any hockey player will tell you that nothing will ever match the feel of ice, but in this review we test how close a hockey shooting board comes to giving you that ice-like feel at home. When you purchase a hockey shooting board, you have a few options. There are roll-up shooting pads and solid hockey shooting boards. With the solid hockey shooting boards you have the choice of sizes. When it comes to selecting a size, we always encourage people to pick the biggest size. The more room you have, the more you can do. 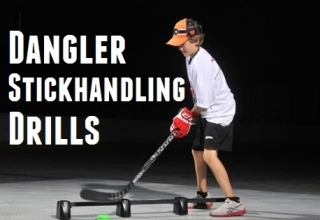 For example with a junior shooting pad you can basically just take slapshots. There is not enough room to for most people to take a full wrist shot and definitely not enough room for practicing stickhandling. 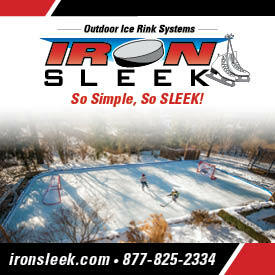 With a pro-sized shooting pad you have enough room for stickhandling, toe drags, and any type of shot. 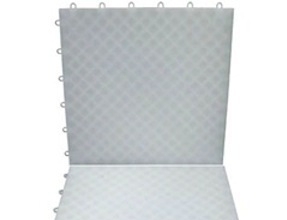 The material used to make the shooting pads is HDPE or High-density polyethylene. This material is known to be very durable (lasting over 100 years in some cases) and also be very slippery. HDPE is used in snowboarding and skiing to construct boxes and rails, and also in the boards that are used in hockey arenas. 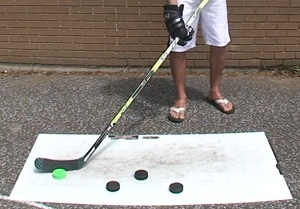 We tested out the pro sized hockey shooting pad from Hockey Shot. We tested it for how well the puck slides, how durable the material is, and if we think it is worth the money! How do the pucks slide? The pucks slide great on the shooting pads, the material has to be the best we have used as far as replicating the feel of ice. 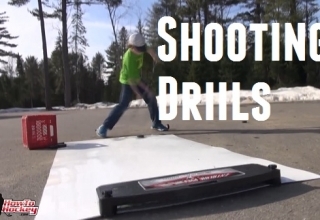 We have tested a lot of do-it-yourself methods like plexiglass and dry erase boards, but the HDPE material used in the hockey shooting board beats them all. Shooting is really easy, with the pro-size we have enough room to take a full wrist shot, snapshots, and slapshots. We can even turn the shooting board sideways and line up a few pucks for rapid fire shots. Moving the pro-sized shooting board is pretty easy, it comes with a handle built in, so the board is really easy to pick up and store away. If you are looking to take it to a friends place though you might have some problems. The board is pretty big, flexes a bit and it can be a bit challenging to fit into a car. The board will easily fit into a truck, SUV, or van though. The hockey shooting board has quite a few benefits. The first one is that it gives you a nice smooth surface to shoot off of, so it brings you closer to the feeling of shooting and stickhandling on ice. The next big advantage is the fact that the board is so smooth. 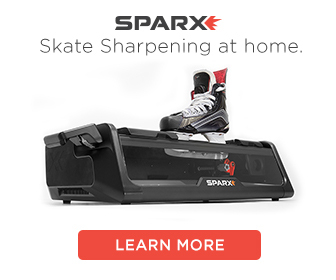 This smooth surface will protect the blade of your hockey stick. If you shoot and stickhandle on pavement, or a rough surface then your blade will wear down very quickly. And anything that will help protect your blade will save you money in the long run. Should You Buy the Hockey Shooting Board? 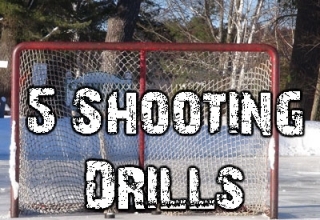 The hockey shooting board is one of those must-haves for hockey players. If you want to practice shooting and stickhandling on a regular basis you need a good surface that the pucks can slide on. Having a smooth surface helps you build muscle memory. If you practice on a surface with a lot of friction, then when you go on the ice and try the same move, it will not be the same. 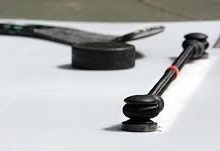 We definitely recommend a hockey shooting board, or a roll up shooting pad for any hockey player who wants to practice stickhandling and shooting. In this video we show you how well the pucks slide on the hockey shooting pad, the durability of the board, and test it out on the streets. 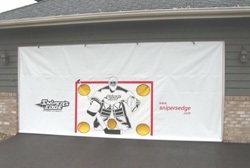 To check out the hockey shooting board, and the roll-up shooting pad visit Hockey Shot today. I got a quick question, when you order something from hockeyshot.com, do the packages show up at your front door, or do you have to go pick them up from the post office? I think it depends on the product. For smaller items they were at the post office, for big items they were delivered right to the door. Hi Boots, I’m thinking about doing the same thing. How is the board working for you? is it slippery enough? thanks!